The historic Bavarian city of Augsburg is situated on the river Lech. The trams are the main feature of the attractive old town where the seven lines run in from the modern suburbs. Electric trams started back in 1898 and still run on metre gauge track. The fleet in 2012 is made up of 11 GT6M Astranz/Siemens, 41 Combino (Siemens) and 27 CityFlex (Bombardier) in an attractive olive green and off white livery. Some of the trams are in overall advert schemes which adds extra colour to the city. Our filming starts at Fischer Strasse and moves to the busy centre of the old town at Moritzplatz. Further filming takes place at Rathausplatz, Karolinenstrasse, Fuggerstrasse and Köningsplatz. We then move to the historic small town of Ulm in southern Germany. Electric trams go back to 1897, and to this day they run on metre gauge track, just operating one route. Route 1 goes from Sölfingen to Böfingen. The fleet consists of 10 Combino (Siemens) trams in an attractive pale blue, white and black livery. Each of the trams are named, with their name carried vertically on the side near the front of the car and above the fleet number of the front and back of each set. Our filming takes place at Bahnhofplatz on Friedrich-Ebert-Strasse and along Olgastrasse. The final system that we visit on this programme is to the attractive and historic city of Freiburg, situated between the Rhein and the Black Forest. The trams operate through the narrow streets of the city centre and through the old city gate towers before serving the suburbs around the city. Electric trams began in Freiburg in 1901 and also run on metre gauge track. The fleet is made up 5 GT8K (Duewag), 11 GT8N (Duewag), 26 GT8Z (Duewag) and 18 Combino (Siemens) and operate in an attractive dark red and white livery and run on 5 routes. Our filming starts at Hauptbahnhof. We then make our way along Bertoldstrasse to the busy Bertoldbrunnen and then along to Salzstrasse. 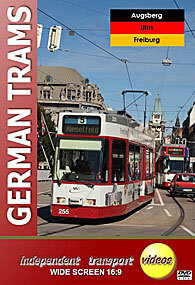 We continue to Kaiser-Joseph-Strasse and see the trams running through the historic city gates. More filming is done in the city centre. Probably one of the most attractive cities in Germany. Duration : 94 minutes (approx).